Make your kitchen the heart of your home with Dream Doors South Glasgow. Speak to our designers and view our stunning collection at your local kitchen showroom. A great kitchen is the heart of any home, so make your dream a reality with help from your local kitchen experts at Dream Doors South Glasgow. From design to fit, our professional team will help you create your ideal kitchen. 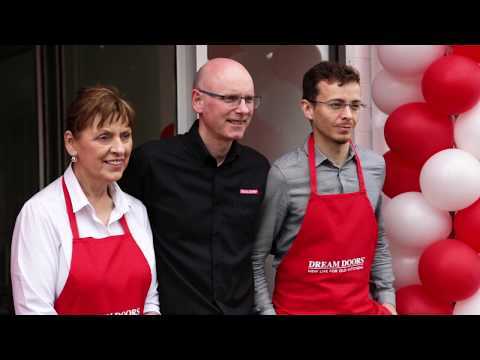 Ian, owner of Dream Doors South Glasgow, is on hand to help you create the perfect kitchen for your home. In our showroom you will find designs and styles, ranging from classic to contemporary, so you can find the inspiration you need to makeover your kitchen. Gary will be happy to talk through your ideas and help you design and build a practical but stylish kitchen that serves your everyday needs. At the South Glasgow Dream Doors showroom in Shawlands, we house kitchen cabinets, worktops and appliances so you can see what is on offer, from monochrome kitchen spaces to traditional country styles. Classic and contemporary kitchen design doesn’t have to involve the replacement of an entire kitchen. New kitchen doors and worktops are an affordable option that can transform the overall look and feel of your kitchen. Even if you want to swap styles completely to a monochrome or high gloss finish, this can all be achieved on a budget with help from our expert design team. With us, you can achieve your dream kitchen for up to 50% less than the cost of a full kitchen refit. Why not pop into our South Glasgow showroom to see what is on offer? Ian can visit your home to help you plan and design your new kitchen. Simply arrange an appointment so he can come and take your ideas on board and provide you with a free, no obligation quote. These visits are useful to help our kitchen designers understand your requirements and bring functionality into your space. Dream Doors South Glasgow offers replacement doors, drawer fronts, worktops and general kitchen services to all G postcode areas South, South East and South West of the river including: Pollokshields, Govan, Cardonald and surrounding areas, Crookston, Pollok, Barrhead, Newton Mearns and surrounding areas, Clarkston, Giffnock, Muirend, Cathcart, Burnside, Rutherglen, Toryglen, Mount Vernon, Baillieston and Moodiesburn. "Perfect and professional - good match and fit. Straight forward, timely and friendly." "Ian was very easy to get hold of and kept me up to date with the work plans." "Completely satisfied with entire service provided, highly recommended." "Following a visit to the shop, Ian very quickly arranged a visit to measure up and confirm quote. Delivery and installation were exactly as agreed. I am delighted with the work." "Absolutely overjoyed. My kitchen is gorgeous. The men did a wonderful job."